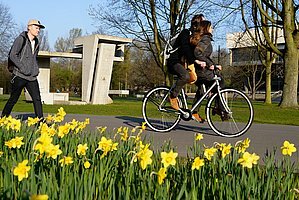 By far most of our staff members (68%) and students (95-98%) use sustainable means of transport such as public transport or bicycles to come to the campus. TU/e wants to make its campus even more sustainable and further reduce its carbon footprint. TU/e pursues a 25% decrease in the number of staff members traveling by car in 2018. To achieve this goal, TU/e stimulates staff members who now still come by car to decide more often on more sustainable ways, among other things by making it possible for them to purchase a bike or an e-bike at favorable conditions. The TU/e campus is a green and sustainable campus of national importance with an international appeal. Thanks to the Green Strip (a green pedestrian and relaxation zone between the university buildings) the campus has the prestige of an urban park. Pedestrians and non-motorized traffic have right of way here. Thanks to the compact layout of the campus the various buildings can be reached easily on foot. Moreover, most TU/e buildings are interconnected by means of walkways. Other residents on the TU/e Campus also can use Studentcar. Check out the website of Studentcar how you can sign up and how you can book a car.